PRODUCT: ULTRA LOW-RISE DECKING FACE METAL. 3" FACE X 2" TOP, 1/16" RISE, 1/4" DRIP KICK ON FACE. 26 GAUGE GALVANZIED STEEL. 10 FEET LONG. PRICE/PIECE. APPLICATION: This Ultra-Low-Rise drip edge metal is designed specifically for waterproof deck coating applications. The 1/16 rise at the edge enables the deck coatings to finish against the rise area, so that the edge of the base coat is not exposed to the sun, to prevent the deck coatings from spilling over the edge while applying, and to eliminate ponding water areas at the outer edge on the finished deck. Its critical that the basecoat NOT be exposed to sun, as its not UV resistance and a leak will form. 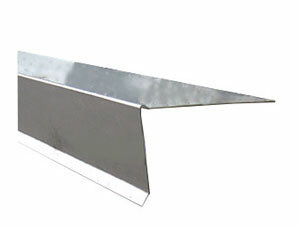 Ultra-Low-Rise Metal Flashings are nailed down with EG, Hot Dipped or Stainless Roofing Nails. Best practice is to first wipe metal clean with xylene and a rag. Then apply a lazy bead of NP1 sealant on the underside of the metal, set in place and nail using roofing nails along the outermost edge of the top side. Nail until ALL the metal is flat and no oil-cans remain. Wipe the outer face of the metal clean with xylene and a rag (NO ALCOHOL based products). Prime using 733 primer or base-coat compatible primer. THEN, apply white 20x20 mesh fiberglass reinforcement fabric, embedded in either NP1 or 2 stripes of basecoat. Apply another coat of NP1 or basecoat over the fiberglass. Feather out the edge finish onto the wood deck surface. Repeat as needed to hide seam. Allow to COMPLETELY dry before adding basecoat.